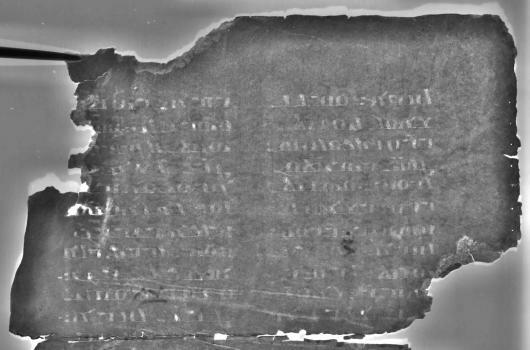 The Sinai Palimpsests Project uses advanced multispectral imaging techniques to recover erased texts from Sinai Palimpsests that are otherwise illegible and in some cases nearly invisible to the naked eye. With Sinai palimpsests, multispectral imaging exploits fundamental differences among the parchment, the ink of the overtext, and the ink of the undertext. Spectral reflectance. The parchment and the inks of both layers of writing differ in how they reflect different wavelengths of light. Narrow-band LEDs illuminate each folio with 12 wavelengths of light from the ultraviolet (365nm) to the near-infrared (940nm). As opposed to the human eye, which is sensitive to only three colors — red, green, and blue— multiple wavelengths of light enable improved differentiation of the “spectral signatures” of the parchment and the two layers of ink. Fluorescence. Parchment fluoresces – effectively glows – when illuminated with ultraviolet light and short-wavelength blue light. Ink residues inhibit the fluorescence of the parchment, such that even faint erased ink often becomes visible in UV fluorescence images. A filter wheel in front of the lens distinguishes reflected UV light and UV fluorescence, and differentiates the color components of the fluorescence of the parchment. Transmission. Iron gall, in which the vast majority of Sinai palimpsests are written, eats into the flesh side of the parchment, leaving letter-shaped channels. Transmissive imaging backlights each folio with multiple wavelengths of light in order to turn these letter-shaped channels into legible text. Raking illumination. Raking light illuminates the palimpsest from a low (15 degrees) incidence angle, providing detail of the surface texture and the rule lines etched into the parchment by the scribes. 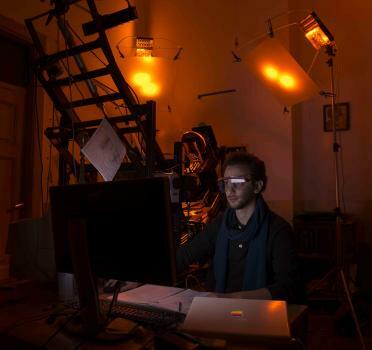 A custom image capture system integrates these previously disparate modalities of spectral imaging, providing high-resolution, spatially-registered images for each folio. 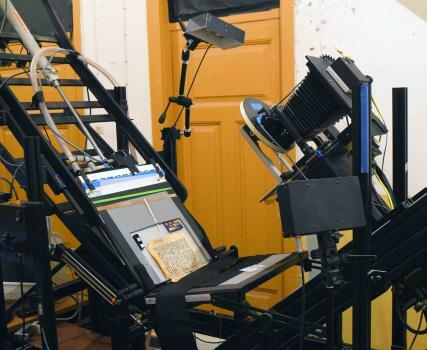 For each of these three modalities of spectral imaging, the project uses narrow-band LEDs to illuminate each palimpsest folio with different wavelengths of light, from the ultraviolet to the near-infrared. These LEDs subject the manuscript to only the required amount of light energy to capture an image at each wavelength. MegaVision: a 50-megapixel monochrome camera (E7), paired with a specialized quartz lens (120mm), which unlike glass, provides focused images across the entire range of wavelengths of illumination. 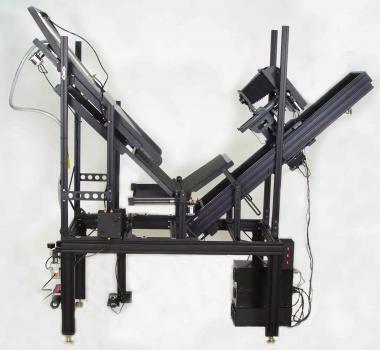 MegaVision’s Photoshoot digital image capture software controls all aspects of image capture and illumination, enabling automated collection of each sequence of 31 images in 5 minutes. Equipoise Imaging: innovative spectral illumination solutions, including main banks of narrow-band LEDs providing illumination in 12 wavelengths from UV (365nm) to IR (940nm), raking illumination in blue and IR, and first-of-their-kind transmissive spectral illumination sources – one with a beveled edge which can be inserted behind folios in a codex and a second for use on a copy stand. Stokes Imaging designed a computer-controlled cradle for fragile codices, the Preservation Book Cradle, which rotates the spine of fragile codex according to the natural movement of a book as its pages are turned. Raw, captured multispectral images are combined using digital image processing techniques, in order produce derivative, “processed” images which maximize the legibility of the erased text. In order to accommodate both the volume and complexity of the Sinai Palimpsests, both automated and manual image processing techniques are applied. Automated processing techniques combine two or more raw images into a single processed image by simple arithmetic. For example, iron gall ink tends to be most visible in (short wavelength) UV light and less visible in (longer wavelength) red and infrared light. Subtracting an infrared image from an ultraviolet fluorescence image has the effect of reducing the contrast of the overtext, while enhancing the contrast of the undertext. Whenever this automated processing routine does not return legible images of erased texts, imaging scientists will review the raw images and manually apply other image processing methods to recover the erased layer of the more intractable palimpsest folios. Manual methods analyze the ensemble of spectral differences obtained from multiple illumination modalities in order to increase the legibility of the erased text. 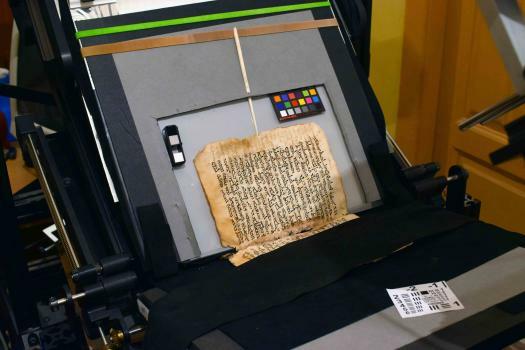 The spectral imaging of Sinai palimpsests begins with solving the problem of how to support brittle ancient manuscripts during spectral imaging. The variable that most effects the time required to image a Sinai palimpsest is its state of preservation – its fragility. Therefore, the project uses the Preservation Book Cradle by Stokes Imaging (owned by St. Catherine’s Monastery). The computer-controlled cradle rotates the codex according to the natural movement of a book as its pages are turned, so that fragile codices can be imaged as efficiently as possible without damage. 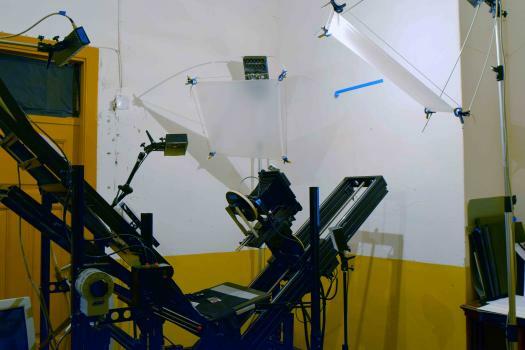 For unbound folios, bifolios, and fragments, the project uses a simple copystand with a camera on a vertical column.